The business case for sponsorships and charitable donations in an employer’s local community is well documented: it increases brand awareness and name recognition, may lead to improved employee retention, can earn an organization the benefit of the doubt in a crisis, increases the existing prospect and client/customer base and, if done properly, may serve to differentiate your firm from competitors, the latter something with which most firms struggle mightily. The images within this article make the point. 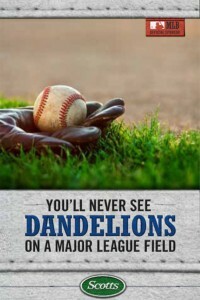 Scott’s aligns itself with Major League Baseball nationwide. Manicured ballparks are incredible demonstrations of the benefits of their fertilizer, seed and weed preventers. 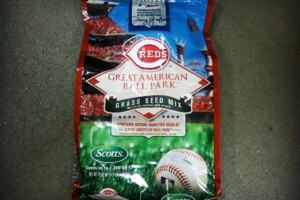 And, you can buy the same seed used at each park for your own yard. Spring and baseball represent perfect timing. Overall Scott’s hits a home run of product, placement and promotion. Scott’s thought it all through well in advance of Opening Day, too. Foley’s offices were adjacent to the incubator. In other cities, firms seeking to extend their reputation and gain work with emerging businesses have leased small buildings. They offer low-cost work space and put satellite law offices there. They offer informative legal seminars on site and non-traditional office hours. Having startups nearby is a way to build long-term, mutually beneficial relationships in markets where young companies might become the next big thing, as well as the next big client. What better setting is there for a corporate and securities practice? Compare that expenditure to a single month’s list of sponsorships recently up for approval at a firm we represent: a music festival, summer camp, charity bike ride, reading alliance, the Urban League, breast cancer walk, the mustard seed charity auction and dinner. “This is my marketing budget’s death by a thousand unfocused sponsorship spending cuts,” the firm’s marketer lamented. Indeed it is. Firms should avoid random sponsoring and charitable donations, again many of which come in reaction to a client request (think, arm twisting phone call). Do you really think the client will drop your firm for another less competent one because another firm sponsored an exec’s pet event and you did not? If yes, you have a much bigger problem involving some combination of client service, commoditization and value. Sponsorship is not the answer. BTW, at one MLB baseball game I attended, a local orthopedic surgery clinic was a sponsor, too. They put up quizzes between innings on the scoreboard about sports sprains and strains and what basic first aid made sense in each case for fans to answer. Then, at the end of the game, they gave away small first-aid kits emblazoned with the clinic’s name and contact information…not bad.